Wow this looks fantastic - I love it. Think we (POps) can reduce/simplify the copy for the more traditional “jobs/hiring/open positions” as well to fit with the new cleaner, clearer website. This looks really solid, great work guys! Great catch @cryptowanderer. I completely forgot to mention the security page copy (and a lot of the other copy) is placeholder for now. Apologies for forgetting to call that out. Before this goes out, Im hoping we can have a review of all site copy for technical accuracy, typos, and recommendations. We will have “final copy” hopefully by end of week. I will ping here and tag everyone for a final pass at copy and visual QA. That looks awesome! Like the font and the principles layout. Love that Status being Open Source has found a prominent spot. In 1:1 testing I noticed that with all the new lingo of decentralization, web3, cryptocurrency and blockchain, Open Source DOES ring a bell and is appreciated. @jonathan should we set up a few different copy reviews, e.g. one with someone familiar with our protocol, one for browser/wallet/UI, etc. to step through the relevant sections together? I’ve made a few suggestions on the right in this spreadsheet but have more to do and it will require checking. I think it might actually be most effective to collaborate in real time. @rachel - this would be a great idea. Im hoping to have have copy and asset reviews complete by Wednesday so we can finally push this live. If you feel dedicated copy reviews are needed, I am open to that but I think we mostly just need to review for technical accuracy. A lot of the content across the site is fairly high level and written in a specific tone. So perhaps we can have teams review the features copy on both the homepage and features page. WDYT? I think a quick review async will work fine. Please remember, much of the copy on these “marketing” pages are designed to provide basic info for interested viewers and then drive to the related docs, blog posts, tutorials, etc, for more info. Im hoping to have all copy final by end of day Wednesday so we can launch on Thursday. This statement is a bit confusing: Extensions allow you to leverage the native of features of Status within your DApp. 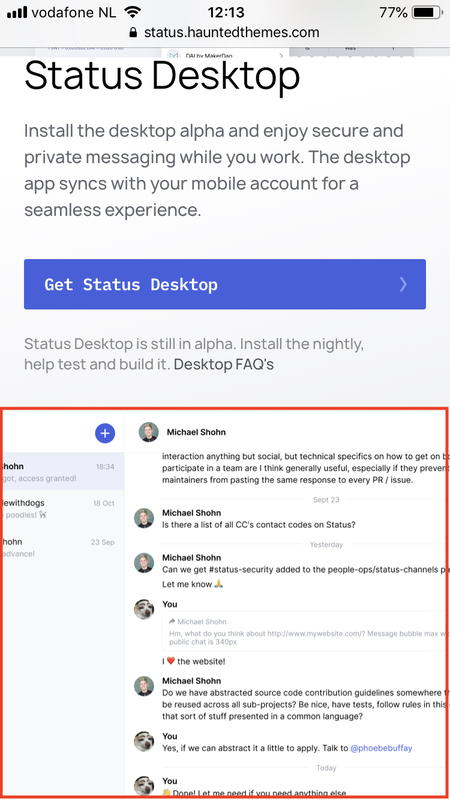 Extensions won’t let you leverage Status features in your DApp. 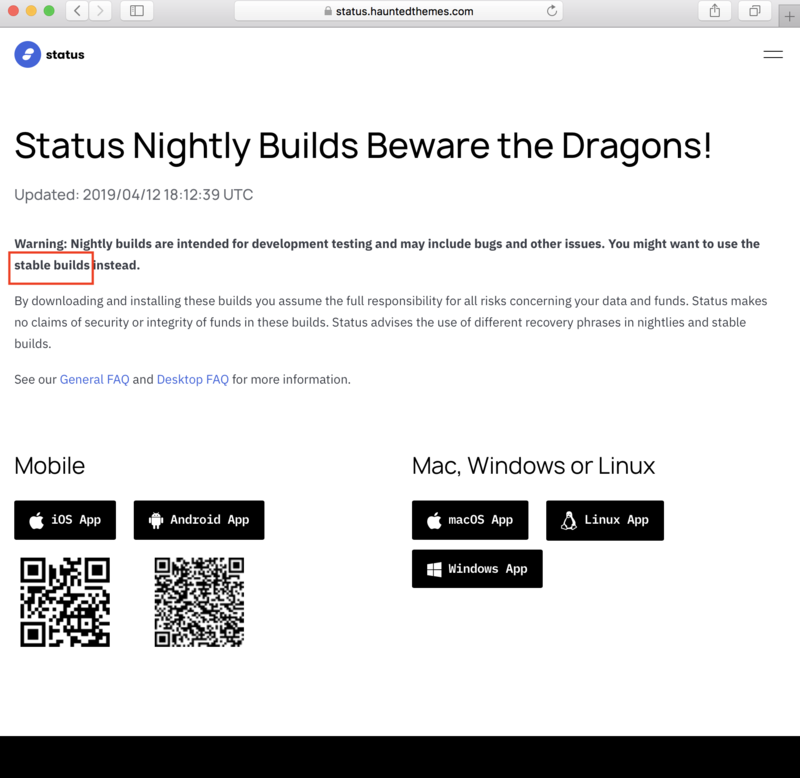 More the other way around actually: leverage your DApp feature within Status. Note that we also offer extra APIs on top of web3, Status API. Those match more closely the original description. Missing a quotation mark at the end of Jarrad’s sentence. I don’t have a good one. It might be a bad name (Poe’s law, etc). I agree the title is clickbaity. Full support for all ERC20 and ERC721 tokens on Ethereum network. Send, store, and receive your tokens or collectibles confidently in Status. Collectibles can’t be sent directly from wallet. They can be viewed and as Julien said, if they are among the selected few collectibles integrated with the app. On the same page, screenshot on the right side displays a transaction overview from a design which hasn’t been included in the app release. It should (probably?) display a screen as it is in the current version of the app.